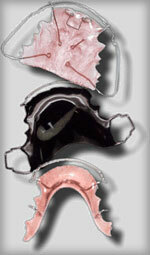 Holding Arches: These fixed appliances are a terrific method of holding valuable space so that a patient can retain all of their teeth, leading to a fuller smile. Bionator: Also used to correct overbites in younger patients, and this appliance is removable. Palatal Expander: Designed to widen your upper jaw, a palatal expander applies outward pressure on your upper teeth to slowly expand your palate. Spacers (Separators): Spacers are elastic rings that are inserted between back teeth before you have braces, providing space for back braces. Elastics (Rubber Bands): Rubber bands are used with braces. They help close spaces and improve bites. Housebrace/Headgear: For a severe overbite or underbite, a housebrace is sometimes used to help improve jaw growth and facial balance. Positioners: Sometimes required to complete necessary final tooth movement to achieve an excellent smile. It looks a bit like a clear sports mouthguard. Several Others are available that we can recommend and discuss with you based on individual needs.